‘It was the best of times, it was the worst of times’, is one of the most quoted phrases of all time. 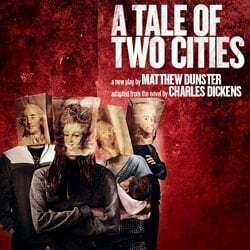 Unfortunately, Matthew Dunster’s adaptation of the Dicken’s classic A Tale of Two Cities, directed by Tim Sheader and currently playing at Regents Park Open Air Theatre, is not nearly as memorable. Originally set in the early days of the French revolution the story addresses questions of class, displacement, and homelessness. It’s easy to see that it, therefore, lends itself to adaptation given the prominence of these social challenges in modern society. That said, it feels as though the artistic vision of this piece is entirely confused and rather than discussing displacement it leaves the audience utterly displaced with regards to the temporal and contextual elements. This is in no way helped by the costume design, a constant paradox of 1800s French aristocratic dress and modern day converse with jeans. Whether or not this was an intended juxtaposition is unclear, but if so the execution needs to extend to other elements of the production to avoid confusion. The set design is simple but effective and certainly demonstrates innovation. There are some really powerful tableaus created and the transitions are seamless, utilising the onstage shipping containers to their full potential. What undermines this is the poor use of line in staging. While every attempt is made to capitalise on the available levels, in many instances the distinct lack of line makes it difficult to follow the movement of dialogue on stage. On several occasions, I heard whispers of “wait, which one is talking?” among the audience, and I have to say, more often than not I was unsure myself. The music also provides somewhat of a juxtaposition, with the soundscape designed by Christopher Shutt largely providing what you would expect. Fast forward 5 minutes and you have a dance track that, while comical, couldn’t seem more out of place! Absurdity in Dickens is not a new idea, but I’m not convinced that this really fit. In spite of artistic direction, the cast have it well within their power to carry this show and ensure it is engaging and thought-provoking. Despite the appropriated context, Dickens’ complex characters provide all the ingredients which should enable the actors to salvage the production. Unfortunately, the vast majority of performers completely lacked both conviction of character and the energy and exuberance necessary to engage an audience in such an open space. The two notable exceptions to this are Nicholas Karimi and Francesca Mills. Karimi seems to be the only cast member with enough commitment to engage the audience. Establishing a rapport with ease and creating some of the only moments of intrigue within the plot, he performs in a class of his own. Likewise, Mills exhibits an energy and intensity which is a breath of fresh air in moments of stale drama and appears to be the driving force of the ensemble. This production has so much potential and I can only hope that over the next few weeks it has new life breathed into it. Such a poignant story underpins the piece and clearly, it is not lacking in good intentions. That said, the creative team needs to establish a consensus of vision and ensure this consensus extends to their cast because, in its current state, confusion abounds for both company and audience. Sound familiar? How much more do those in power think Europe’s poor can take? When will the people take to the streets of the cities and roar enough is enough?